I think pretty much everyone has a story about where in their childhood home they marked their height as a kid. I always loved the idea of having a visual representation of a kid’s growth in the home, but I never loved the permanence of it all. I grew up in one house, and then moved to another when I was 11—and with that move, my growth marks stayed behind. I was always a little sad that part of my childhood didn’t get to come along with me. 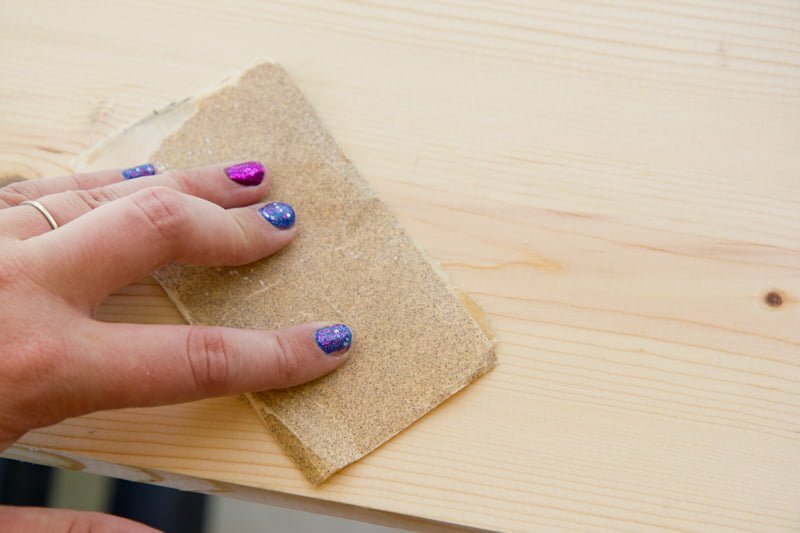 And of course, moving isn’t the only way the marks can disappear—maybe you want to paint a wall or remodel a room. Once those marks are gone, they’re gone forever. So when I was flipping through Pottery Barn a few years back and saw their ruler growth charts, I knew that was the direction I wanted to go when we eventually decided to grow our family. Not only were they adorable and quirky, but, most importantly, they were transferable. 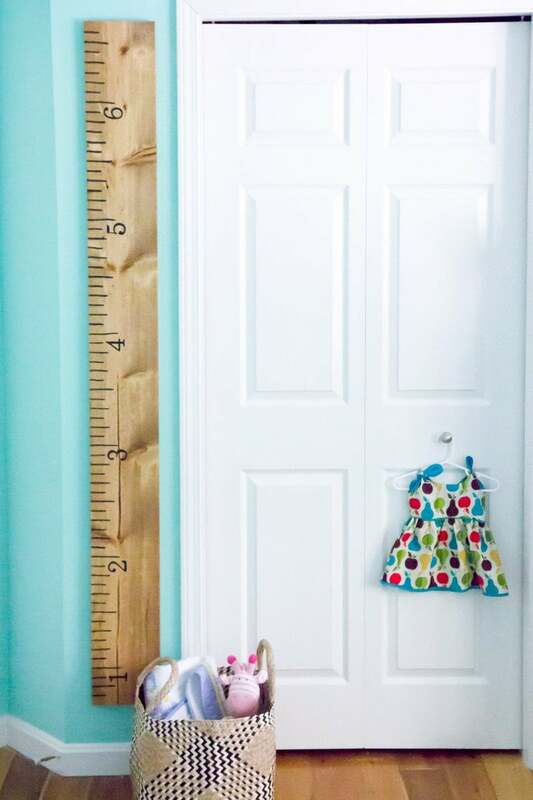 While Craig and I don’t plan on moving out of this house until we’re old and gray, the truth is, you never know where life will take you, and I love that wherever we go in life, we can take this growth chart ruler with us. Of course, I couldn’t stomach the $90 price tag on the Pottery Barn version. 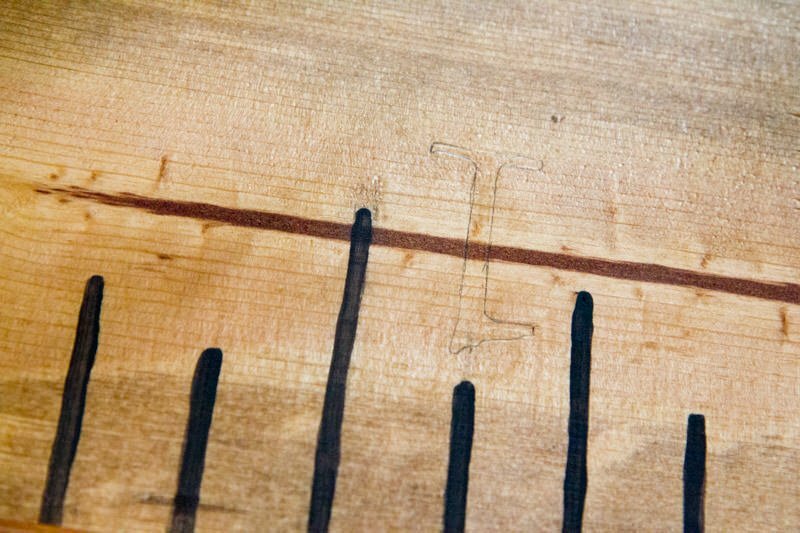 I mean, after all, it’s pretty much just a piece of wood with some tick marks and numbers painted on it! So when it was time to start working on Baby J’s nursery, I decided I was going to make my own. And I did, for about $15. Hanging method—sawtooth hanger, heavy duty mounting tape, anchors and screws, etc. We had nearly everything to make this at home, except the board. A quick trip to Home Depot and we had ourselves a 1” x 8” x 6’ premium board for less than $10. Make sure to look for one that isn’t warped and has a texture and grain you like. 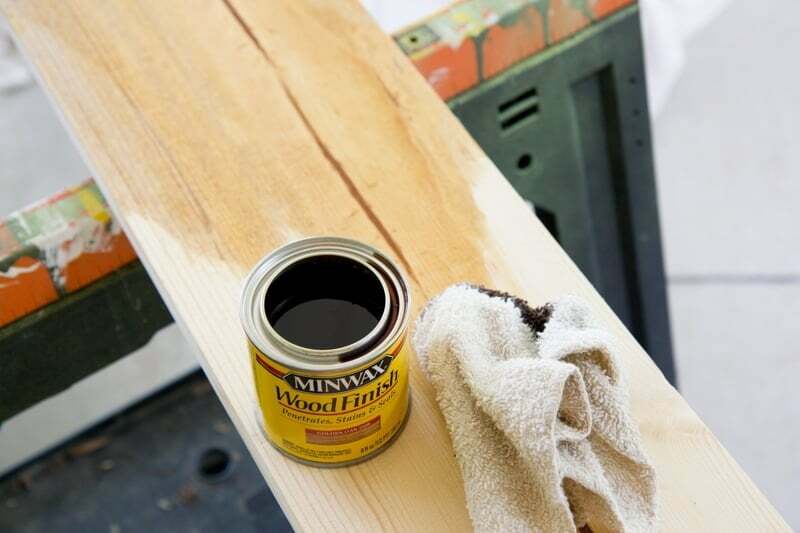 We went back and forth about staining the board (after all, most new rulers have that light, pine board color to them), but decided we’d rather darken up the color a bit to match the rest of the wood in the room and help make it feel a bit rustic and old. We knew we wanted black numbers and tick marks, so we didn’t want to go so dark those didn’t show. So we landed on this oak stain. 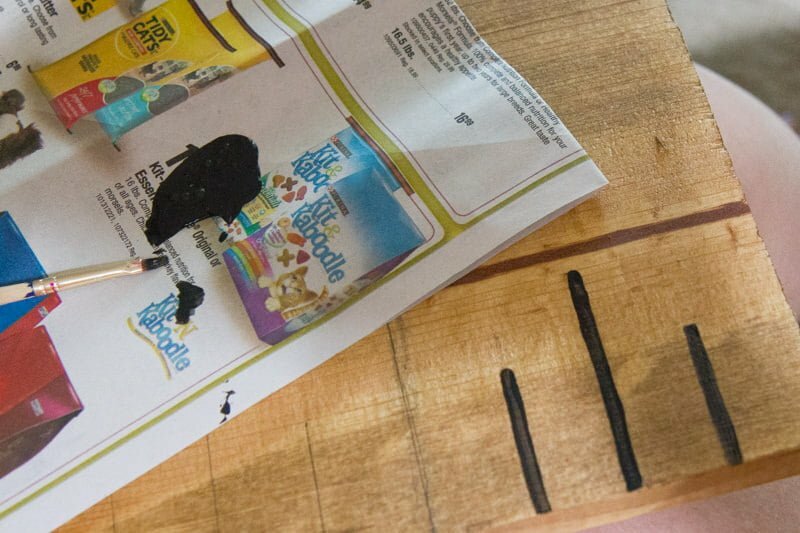 A small can for $3 was plenty—we could probably make 10 more growth chart rulers with how much stain we had leftover! 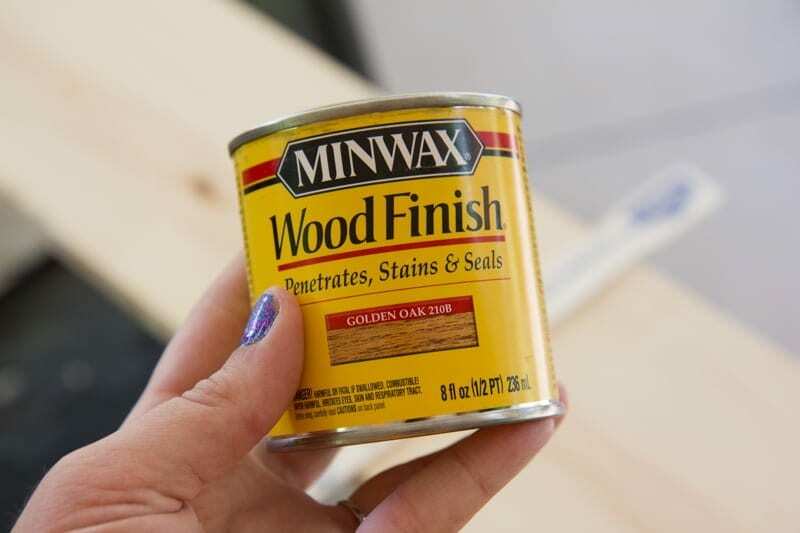 Before staining, per the instructions on the can, I lightly sanded the wood using a fine-grit sandpaper going in the direction of the grain. I wiped off the sanding dust and let it dry completely. Then, I used an old cloth and applied the stain. I let the first coat dry per the instructions, and then applied a second for just a slightly darker tone. Like I said, we still wanted to use black lettering, so I didn’t want it to go too dark. All done! I let it dry outside for a few hours until it was dry to the touch, and then I brought it inside to start putting on the marks. I used a ruler (this clear grid ruler worked really well for me, but a regular ruler would work, too). I decided that I wanted to hang the ruler 8” up from the floor in the nursery, so I started my first hash mark at the 9” spot. There, I just drew a pencil line. 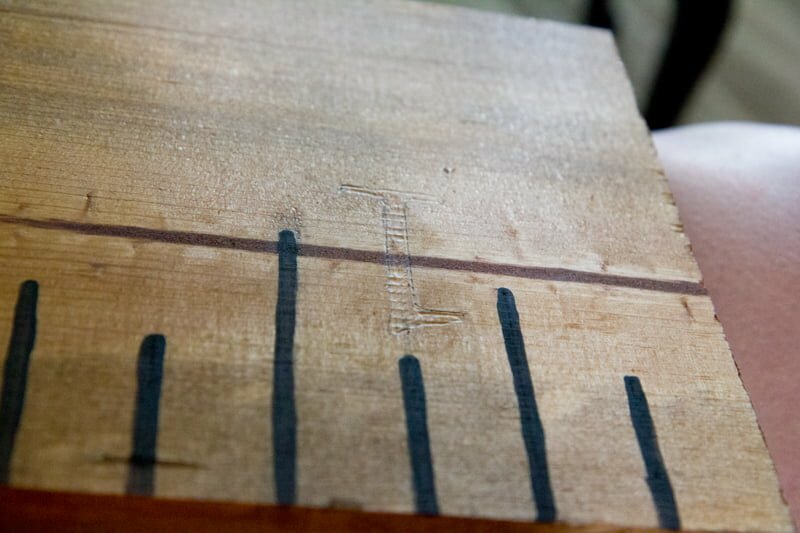 To keep the ruler looking authentic, I made the 1/8 marks 1-1/2” long, the 1/4 marks 2” long, the 1/2 marks 2-1/2” long, and then the foot marks 3” long. You can play with it to see what lengths feel right. I made my way all the way down the ruler making marks with the pencil. It sounds tedious, but it really only took about 30 minutes. Then, I came back with a thin paint brush, black acrylic paint and a steady hand. I just painted right over top of the lines. It definitely isn’t perfect, but I kinda enjoy the wiggly, handmade quality of my lines. And from two or more feet back, you can barely tell the lines aren’t perfectly straight. The next step was to put the numbers on. I headed to my computer and found what I thought was a ruler-y looking font—Century Schoolbook—and printed out the numbers 1-6 at 200pt. Honestly, you could go with whatever font makes you happy, I just like the traditional look. Then, I lined up the numbers with the foot hash marks. I did a little research about how “traditional” rulers do this, and they usually actually put the number directly before the corresponding hashmark, instead of below it. So that’s what I did. And then I used a mechanical pencil (with the lead retracted), to burnish around the outline of the number. 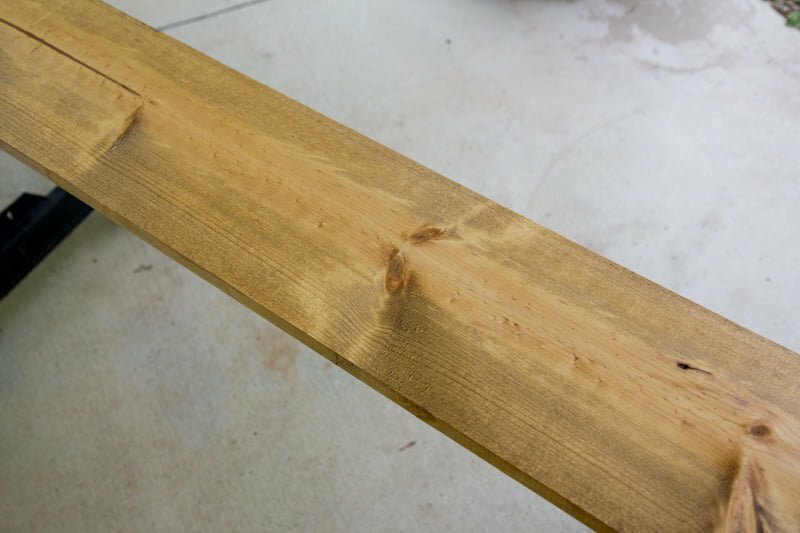 Because the wood was soft, this transferred an indentation to the wood. 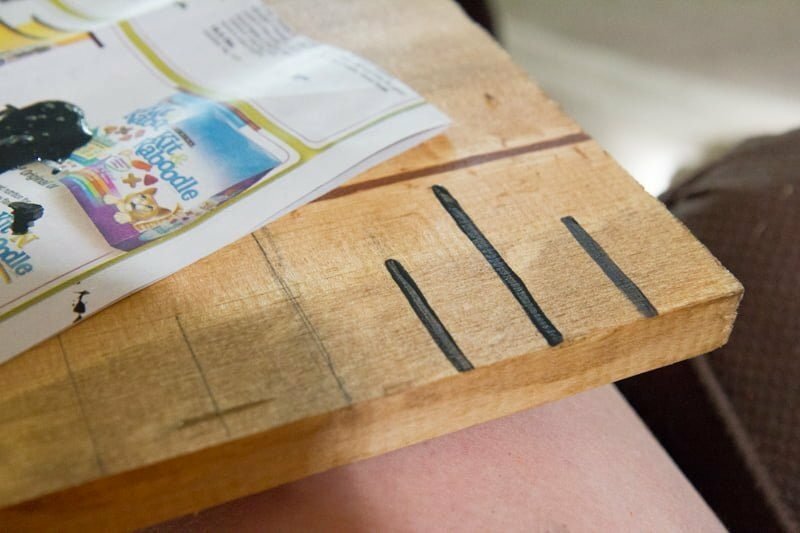 And then I used a pencil to define the edge a little more on the actual wood. I transferred the stencil for all the numbers, and then came back with my paint brush and black paint and filled in the lines. I love that the numbers are a little bit debossed. Once all the acrylic paint was dry, I took the board back outside and gave it two nice coats of satin polyurethane. I went with satin because (a) it’s what we had on hand and (b) I feel like the satin will protect the board, but still allow us to write over it with a permanent marker or paint marker (whereas a gloss might not). 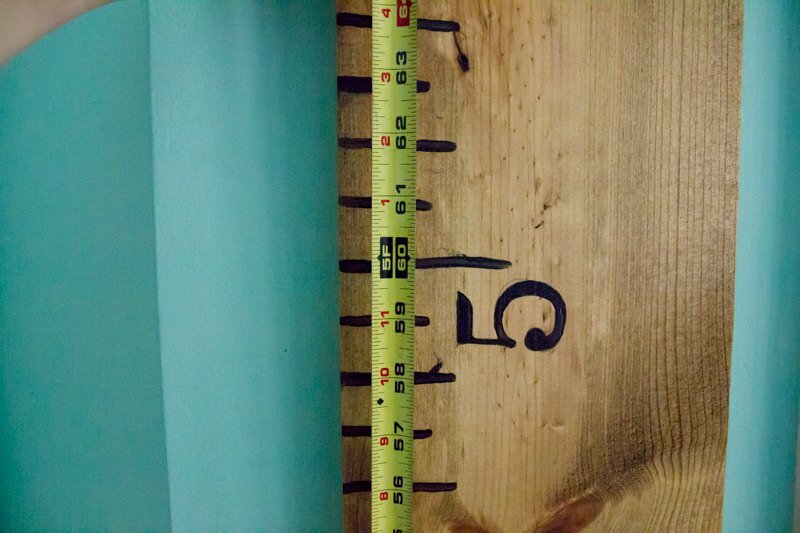 I left the board outside for the evening to off-gas and finish drying, and the next morning, we put heavy duty mounting tape on the back and hung it up on the wall (making sure to measure up 8” from the floor). 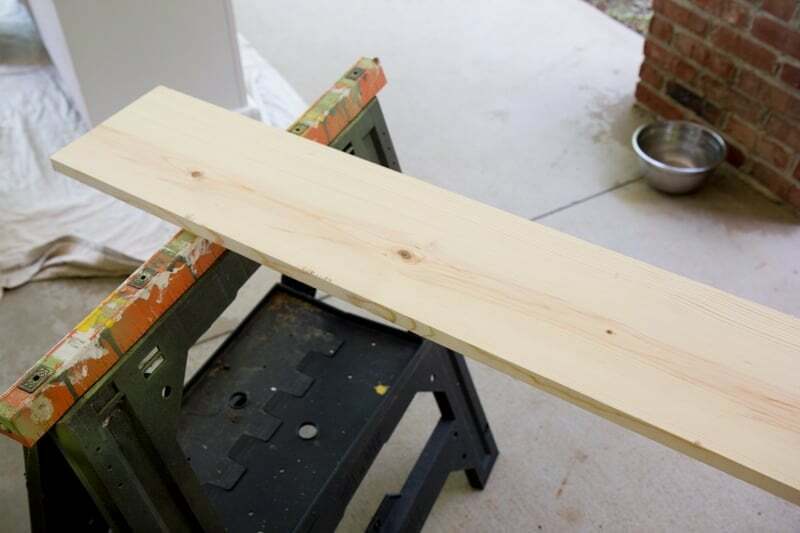 You could also use a sawtooth picture hanger or screws and anchors. We like the mounting tape because it’s crazy secure (we used enough to hold 20 pounds, but the board is less than 5), doesn’t require any holes in the wall, and the board is completely flat against the wall—no wobbling or bobbling. Just to make sure all is right, I then took a tape measure to verify that the ruler was going to measure correctly—and it does! Spot on, in fact. I am absolutely in love with this little project. Not only do I think it’s adorable, but I love that it’s functional and portable. I can’t wait to start marking Baby J’s progress as she gets bigger and bigger. Did your family keep track of your growth when you were growing up? Did you have a special door frame or wall that shows your progress? I love how yours turned out! I’ve been wanting to DIY this too! How did you hang it? Where did you get that dress?!! My sister in law made me one of these for Christmas and I LOVE it!! It’s such a fun addition to our home- I’m sure you’ll love it just as much as us! We actually haven’t marked a height yet because haven’t decided how, yet! I’m thinking a gold paint pen or a black Sharpie. We used a thick black sharpie and it turned out great! Just a quick question…it looks like you only marked off the inch marks not the 1/8 or 1/4 marks. Did you just vary the length of every other inch mark? I am making one as I type this and in looking at your picture with the tape measure, each mark is at an inch. 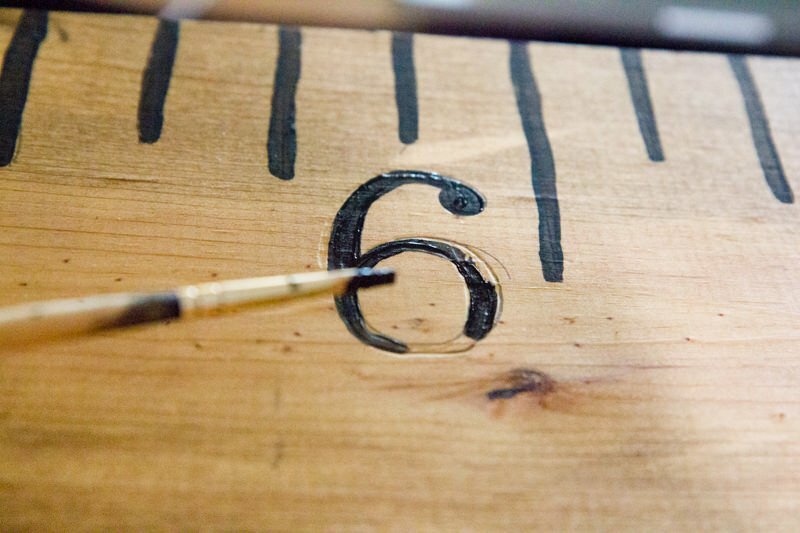 Just checking because I think it would be too many lines if I marked the eighth and quarter marks….Yours looks great! We added a sharpie marker holder on the back of ours and we are giving a 5 pack of colored sharpies as part of the gift so each child has their out color. I am in the process of making this and noticed the same thing….the finished picture is not the same as the picture of the board in process. 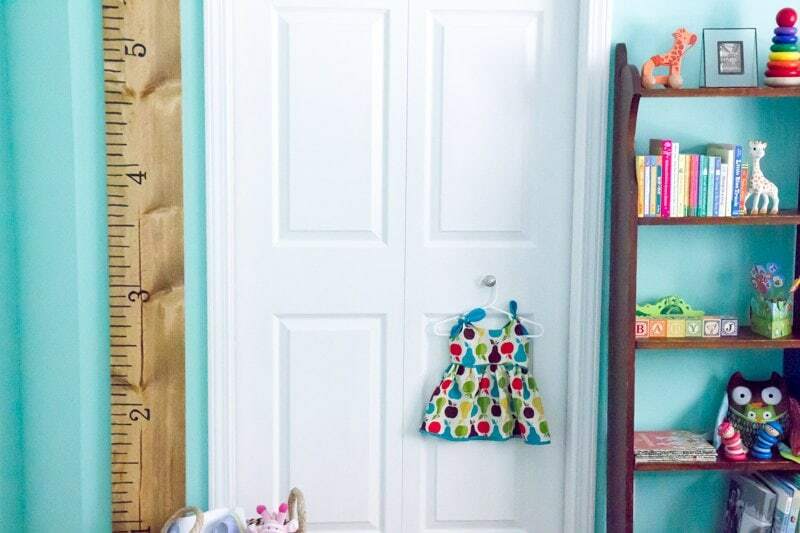 I just made this growth chart yesterday, it was so much fun! It turned out perfectly and we are going to start marking on my daughter’s 3rd birthday on Sunday. Thanks for a great tutorial! Thanks for this great tutorial! I appreciate how much detail you included, it was very helpful. This came together so easily and looks great. 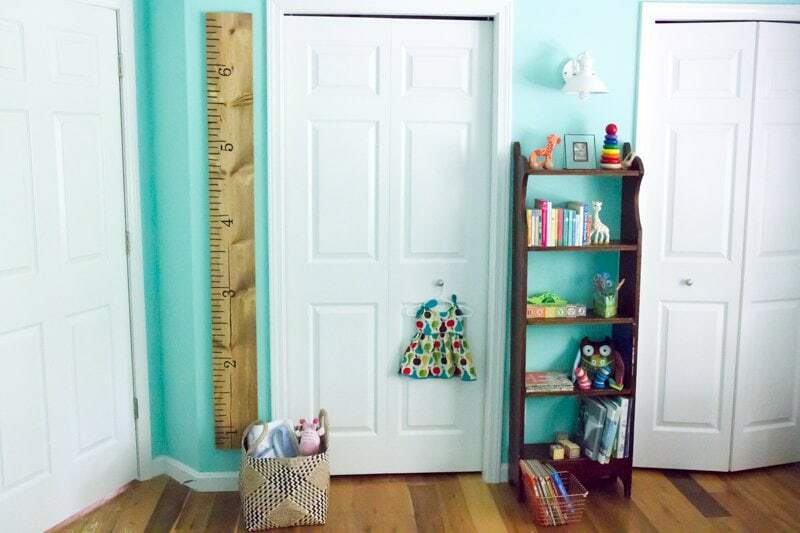 Many of the inexpensive growth charts that can be purchase have style/patterns I don’t really like, and I love the look of this. That trick for getting the numbers on there is what really makes it look like a ruler. I decided to not stain my pine board and I like the look of it as is. Also, I used a Sharpee instead of paint for my lines and numbers, using a rule to make my lines straight. The greatest thing is, if you move, you just bring it with you! Did you use 3MM mounting strips to hang this? I was just curious what kind of mounting tape you used. Thanks! Thanks for this great tutorial! I just made this for my kids for Christmas and it took about 2 hours total – way less than I expected – and it turned out great! We used heavy duty mounting tape. Worked like a charm! Can you share the mounting tape you used? Sure thing! This stuff: http://amzn.to/21vUxTR Hasn’t budged in two years! Thank you for this tutorial! I used your instructions and made one today. I’ve been wanting to do this for so long! I have other growth charts for my kids, and will transfer the heights and dates onto this one as soon as I decide what to record them with (which kind of pen). Anyway, thank you again – great instructions and pictures! I used your font and font size – perfect! I bought a board from Home Depot but mine has wax on both cut ends. Did yours and if it did, how did you get it all off? There wasn’t any wax on mine! Sorry. Hopefully someone else can chime in with help! I started making one yesterday. Will let you know how it turns out. 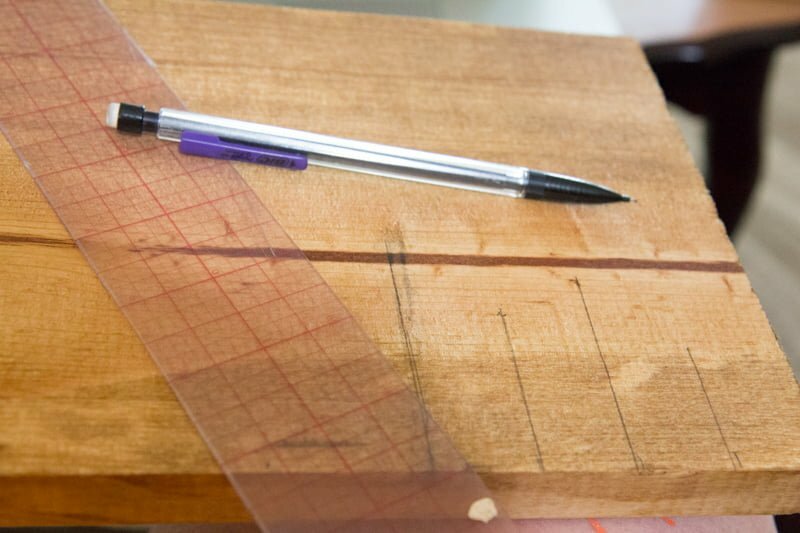 I am in mid-creating of the ruler from your tutorial! Thank you for giving specifics that are easy to follow. As I look at your post, I really love the wall color that the ruler is hung on. Do you remember what brand and color that room is! Thank you! How does the wall hold up when you have to take the tape off? 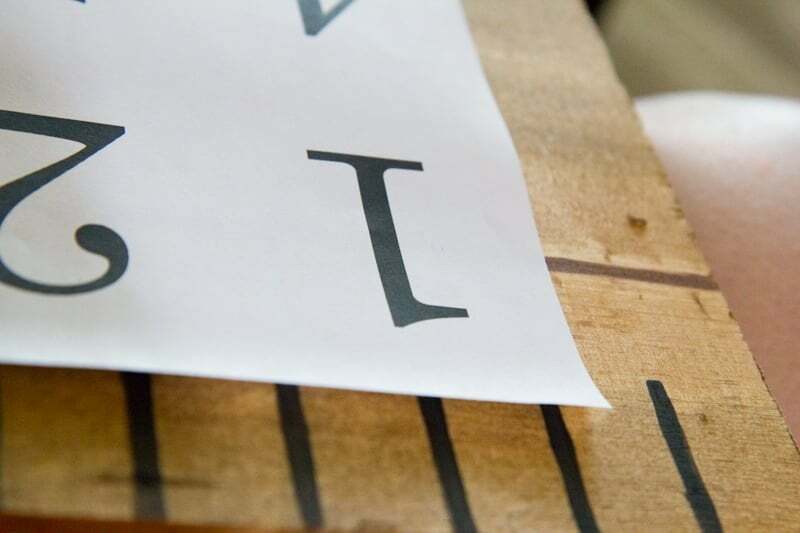 What did you wind up using to mark the height? Quick question- where did you mark the heights- on the side, front, by the numbers, by the lines, etc? I can’t decide where it would look best. I have 3 kids so far and aren’t done yet so I can’t decide if all on one ruler would be too crowded. I just made mine. SO you DID polyurethane it, and the sharpie DOES work to mark the heights? Mine took me FOREVER, so I canNOT mess it up now on this final step!! Looks like a fun and easy project! I am sharing this on Pinterest. I have been struggling to think of just one more thing to give my grandson for Christmas and then I saw this! It’s perfect and I so appreciate the inspiration and the awesome tutorial Thank you! how did you get the font at 200? My win-10 only goes to 72. Just type in 200 in the box where 72 is and it’ll adjust. Have you tried shipping this growth chart? Any clues on how to keep the price down?